This study aimed to determine which preoperative factors affect the postoperative change in the joint line convergence angle (JLCA) by preoperatively quantifying soft tissue laxity. 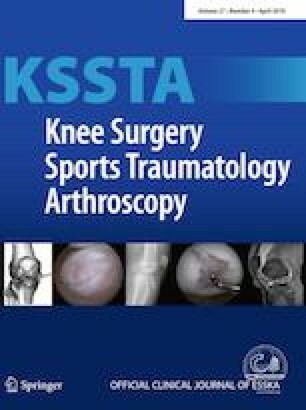 Thirty-four patients who underwent medial open-wedge high tibial osteotomy (HTO) with a navigation were analysed. The JLCA change after HTO was calculated using standing long-bone anteroposterior radiographs taken preoperatively and 6 months postoperatively. Latent soft tissue laxity was defined as the amount of soft tissue that can be extended to valgus or varus from the weight-bearing position, and calculated by subtracting the JLCA on weight-bearing standing radiographs from that on stress radiographs. Multiple linear regression was performed to determine the preoperative factors that statistically correlated with the postoperative JLCA change. In multiple linear regression, JLCA change had a statistically significant correlation with latent medial laxity (R = 0.6) and a statistically borderline significant correlation with correction angle (R = 0.2). These imply that the postoperative JLCA change increased by 0.6° per 1° increase in latent medial laxity, and increased by 0.2° per 1° increase in correction angle. Latent medial laxity was the most crucial factor associated with postoperative JLCA changes. The JLCA change could be larger in patients with large latent medial laxity or severe varus deformity requiring a large correction, which could lead to unexpected overcorrection in HTO. Postoperative JLCA change should be considered in preoperative surgical planning. Target point shifting within the hypomochlion point could be a strategy to prevent overcorrection, especially in patients with large latent medial laxity. The online version of this article ( https://doi.org/10.1007/s00167-019-05502-6) contains supplementary material, which is available to authorized users. We appreciate Dae-Hee Lee for his effort in providing medical advice in this study. This research was supported by Basic Science Research Program through the National Research Foundation of Korea (NRF) funded by the Ministry of Science and ICT (NRF-2017R1A2B3007362). The authors declare that they have no conflicts of interest in the authorship and publication of this contribution. For this retrospective study, formal consent is not required.